Ask around. 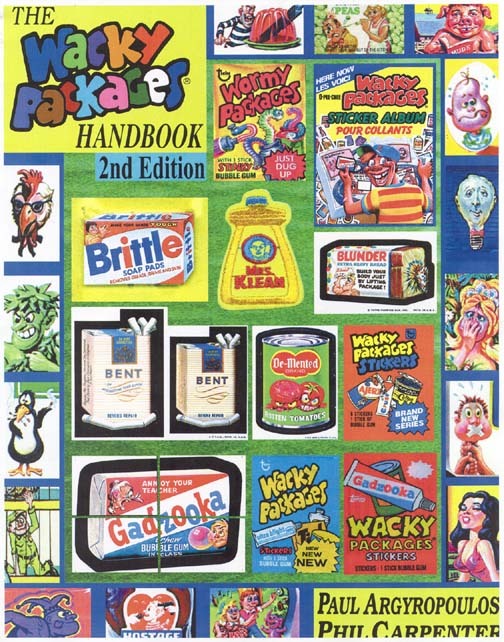 The Wacky Packages Handbook is the absolute best resource for Wacky Packages information. Paul Argyropoulos and Phil Carpenter initially published the Handbook in 1994 to feed the hungry Wacky appetite and it quickly sold out. Now a consortium of Wacky experts have helped generate the most comprehensive resource under the sun. The second edition contains over 150 color photos of rare Wackys, boxes, uncut sheets, proof sheets, unpublished and finished original artwork to Wacky Ads and Wacky Packages, plaques, Canadian Wackys, shirts, pins, etc. etc. etc. Also has the history of Wacky Packages as told by Wacky artist Jay Lynch! The book is 72 pages and is 8.5 by 11 in size. It is large. It is 4 times as large as The Beat Goes On, the only other book on the subject. Also included are advertisements from dealers/collectors for buying, selling, trading, networking purposes. It's like joining a Wacky club. Get the book from the Wacky experts. See premiere Wacky collections with the most detailed scholarship imaginable. Come re-live the Wacky packages fad. There is no alternative.